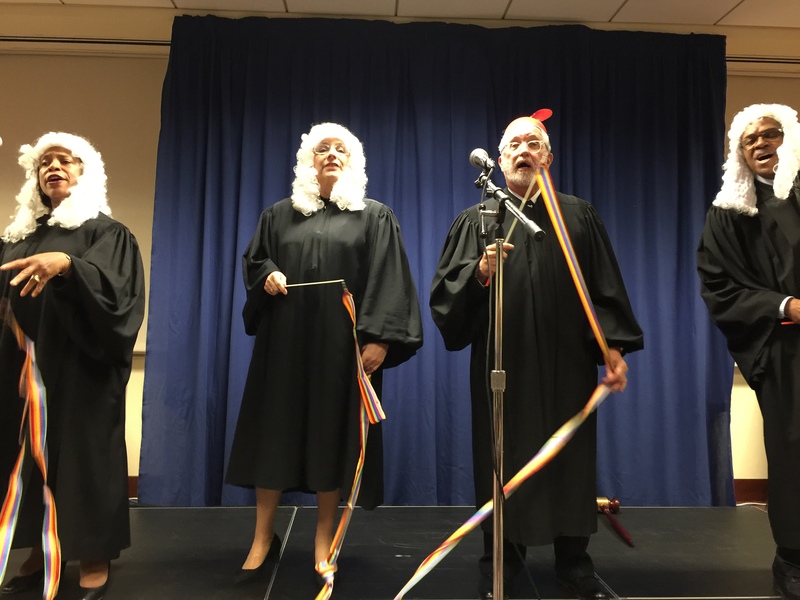 On December 4, 2015, a group of thespians presented the annual Courthouse Follies at the Moynihan Courthouse in Manhattan. The Follies, a send-up of current events using silly songs and comic dialogue, has been a regular holiday gift to the Southern District of New York community for more than 20 years. 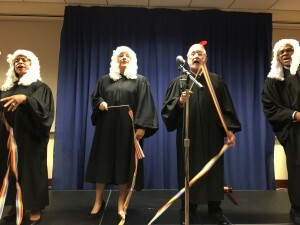 An extraordinary group of Southern District employees and members of the greater courthouse community come together, inspired by the humorous lyrics and repartee written for this purpose and, after a few rehearsals, manage to amuse a crowd full of judges, courthouse employees, attorneys, relatives, and other friends of the court. This year was no exception. The Follies was the brainchild of the late Nancy Festinger, who was a fixture in the Southern District’s interpreter’s office, and although the show initially was performed by members of the interpreter’s office staff, over time it grew to include courthouse employees of every kind, as well as private attorneys, law clerks, and even judges. Nancy was the original creative writer, with a co-creator, although after a few years she partnered with Steven Statsinger, who then was an attorney with the Federal Defenders’ Office and who now is a judge of the Criminal Court of the City of New York. After Nancy’s untimely death from cancer in 2012, the reins of the show were expertly picked up by Nancy’s colleague in the interpreter’s office, David Mintz, and he has continued to collaborate with Judge Statsinger to create the annual show. Judge Statsinger returns to his old stomping grounds each year as co-author in support of the efforts of the cast and crew to create another masterpiece – or, if not a masterpiece, at least the source of much laughter. Nancy once described the Follies as a show that makes fun of everyone, including politicians, judges, attorneys, and the cast members themselves, and that continues to be the great joy of the event. The show has been lovingly dedicated to the memory of the amazing Nancy since 2012. The cast has traditionally included several judges, with a humorous scene written by Judge Jed Rakoff every year since 2000. There was even an occasion when Judge Sonia Sotomayor participated, dressed as a hobo. For the past few years a quartet of judges has trod the boards, presenting a song with original lyrics written by Judge Rakoff. The quartet includes Judge Rakoff, Judge Laura Taylor Swain, Judge Ronald L. Ellis, and this author. This year’s song was called “It’s a Jury Trial,” and it celebrated the joy of holding a jury trial, from the viewpoint of 2030, by which time jury trials, according to the show, will have become a thing of the past. Judges Swain, Ellis, and myself, bewigged, served as senior judges, while Judge Rakoff, wearing a beanie, represented a “baby” member of the Southern District bench. As usual, the song, with its accompanying dance, was a great hit. Other memorable moments included, “It’s Our Job and We Can’t Fall Short,” performed beautifully by law clerks Craig Convissar, Ravi Ramanathan, and Steve Schuldman along with commercial litigator Caitlin Fahey; “Since I am a Rich Man,” in a top notch performance by Craig Convissar; “He Surely Knew What Crime It Was,” sung elegantly as both a ballad and an upbeat jazz number by the show’s prosecutor, played by Labe Richman, who actually is a defense attorney; and “I Don’t Get No Satisfaction,” performed with feeling by David Mintz as Chief Judge Fleska. The raucous finale, “Come, Friends, We’ve Been Set Free,” was sung by the entire cast, and was followed by a standing ovation from the audience. The Follies’ extraordinary pianist, Norma J. Curley, did her usual outstanding job of accompanying the singers, modulating as needed whenever the performers found a new and unexpected way to sing a song. For those who have never seen the Follies, I recommend that next year, in late November, you keep watch for signs in the Moynihan Courthouse advertising the 2016 event. You will not be disappointed! The Worst Supreme Court Decision, Ever!